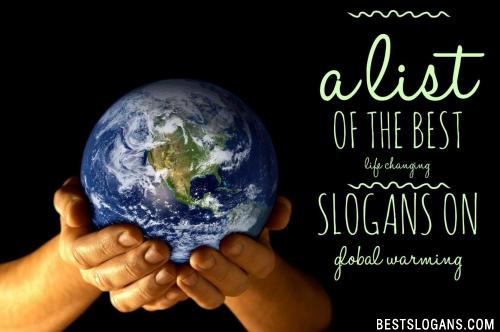 List of catchy global warming slogans in english including pictures to spread awareness and help save our earth. Global warming is a man-made disaster working like a slow poison and ruining the natural environment gradually. Here's a few interesting facts you may not know about global warming. Heat waves caused by global warming present greater risk of heat-related illness and death, most frequently among people who have diabetes who are elderly or are very young. Global warming puts coral reefs in danger as the ocean warms, scientist fear that coral reefs will not be able to adapt quickly enough to the resulting changing conditions, and bleaching incidents and diseases will increase. Global warming is a gradual increase in the overall temperature of the earth's atmosphere generally attributed to the greenhouse effect caused by increased levels of carbon dioxide, chlorofluorocarbons, and other pollutants. Global warming occurs when carbon dioxide (CO2) and other air pollutants and greenhouse gasses collect in the atmosphere and absorb sunlight and solar radiation that have bounced off the earths surface. Normally, this radiation would escape into spacebut these pollutants, which can last for years to centuries in the atmosphere, trap the heat and cause the planet to get hotter. That's what's known as the greenhouse effect. In the United States, the burning of fossil fuels to make electricity is the largest source of heat-trapping pollution, producing about two billion tons of CO2 every year. Coal-burning power plants are by far the biggest polluters. The countrys second-largest source of carbon pollution is the transportation sector, which generates about 1.7 billion tons of CO2 emissions a year. 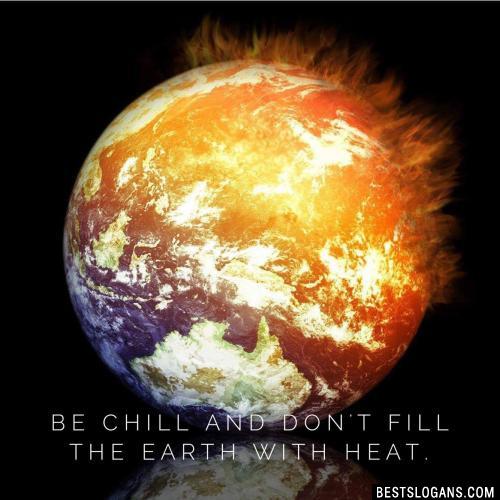 Help save our earth by spreading awareness of global warming. We must STOP climate change. 1 Frosty hates global warming! 2 Trees on, Global warming gone! 3 Global warming is warning us to stop warming the earth. 5 Nurture the nature and save earth from global warming. 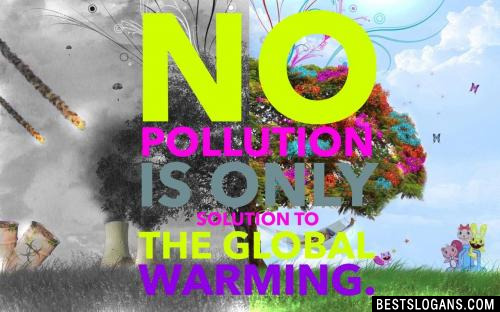 No pollution is only solution to the global warming. 7 Reduce the need and reduce the atmospheric temperature. 8 Global warming is hot, let it cool! 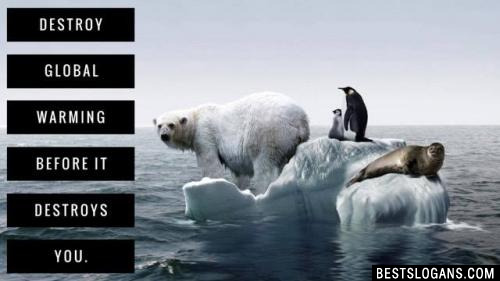 10 It's time to teach everyone to beat global warming. 11 Global warming is heating the earth but why we do not beating it. 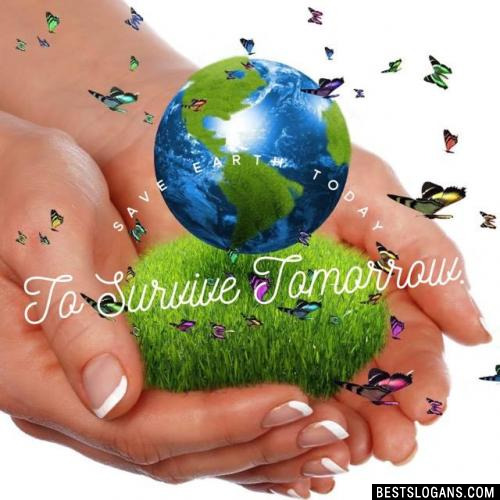 12 Practice natural life style to save earth from global warming disaster. 13 Don't overheat the planet, it will get burst. 14 Take some action to get a little reduction in heat. 16 Now take a decision to stop CO2 emission. 17 If you want to stay, there is only way to stop warming the globe. 18 Our globe is gradually warming; stop cutting forests and let it cool. 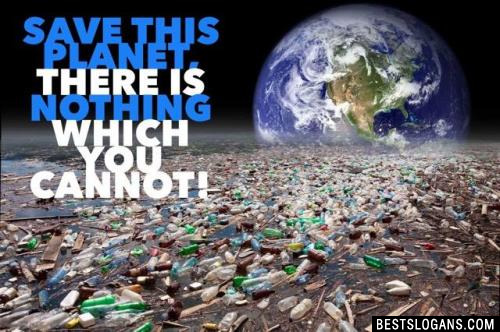 19 We have only one earth; don't let it burst a day! Can you think of a good Short Slogans On Global Warming we're missing? Or come up with a clever one of your own. Please share below.